A review in 10 words (or thereabouts): Embrace what makes you you. Even if that doesn't look "normal". Growing up, Liz Prince wasn't a girly girl, dressing in pink tutus or playing pretty princess like the other girls in her neighborhood. But she wasn't exactly on of the guys, either. She was somewhere in between. But with the forces of middle school, high school, parents, friendship, and romance pulling her this way and that, the "middle" wasn't exactly an easy place to be. Here's the thing about memoirs. It's a story about a person coming directly from the person's own hand. Yes. I know you already know that. But what I'm trying to say is that unlike a biography written by an outside source, we only get to see the world through one persons biased eyes. There's no extenuating circumstances, no different points of view. Do we believe what the person is saying? Do we accept that there truth is the real truth? Personally I like all of the facts. I want to hear what the person has to say. I want to understand what they are feeling, thinking, acting, but then I want to get someone else's thoughts as well. How did said person's feelings, thoughts, and actions look from the outside? Putting that all together, maybe you can really get to know the person behind the story. Long intro there. Sorry. 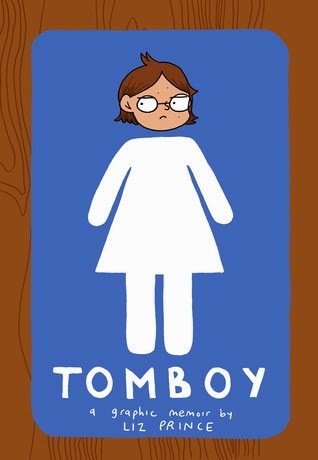 So Tomboy is about Liz Prince, a self-defined tomboy who was more interested in boy activities than girl. Dresses? Yuck! Dolls? No way! Socially determined norms? Screw you! I didn't really like Liz, which is hard to say because this is a memoir, so let me change that and say that I really didn't like the Liz portrayed in the memoir. The "real" Liz sounds like a totally awesome person. I mean, who wouldn't like to hang out with someone who appreciates the genius of Ghostbusters? The story wants you to believe that it's about challenging pre-determined gender identities. Boys must act like boys. And girls must act like girls. But Liz...well Liz wants to be a girl that acts like a boy. Story done. But it comes off as a sort of hatred of femininity. Why can't a young woman be proud to be a young woman, whatever that looks like for her? Why did Liz have to hate all things "girly" to enhance her self-esteem? I want a book that celebrates being a woman however that person chooses to define it. A book where a young woman is proud of who she is, takes chances, colors outside of the lines, but doesn't feel the need to degrade or diminish those who have chosen a different path. Will I recommend this book? Of course. In the end, it reminds teens that being different is okay and acceptance starts with yourself. "Could my problem have been that I was looking for validation in the wrong places all along?" (Pages 241) Some teens really, really need this book. And this lesson. And the knowledge that they are not alone. But I just didn't love it. And I wanted to because Liz Prince seems like a pretty cool lady.